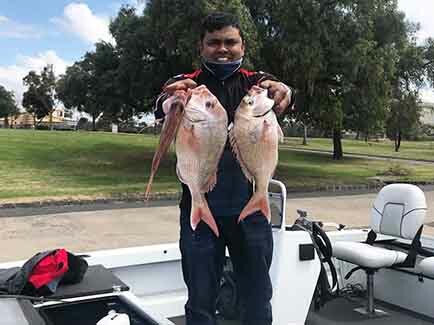 Despite the challenge of very windy conditions and a very small boat Nahid braved the conditions and headed to the shallow reefs of Williamstown. After having great difficulty anchoring up Nahid got things together and caught 3 Snapper, 5 Pinkies, 1 Makrel and 1 flathead on fresh squid from the Footscray market. What a productive fishing session and some PB sessions for Nahid which is amazing news. A big well done from the FishingMad team.